Back-lit banner currently in the hall of the U.S. Patent Office. 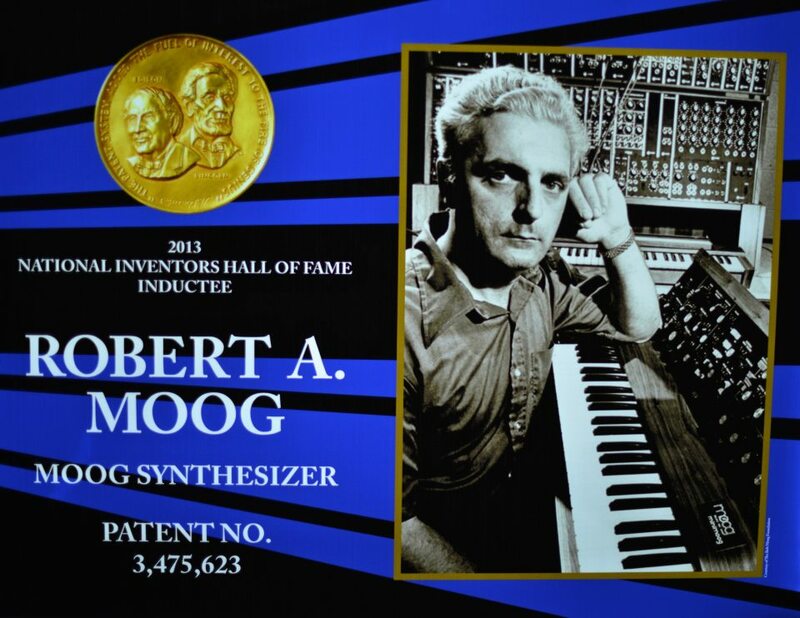 On May 1st, 2013, Bob Moog was inducted into the National Inventors Hall of Fame, a recognition that honors individuals who conceived, patented, and advanced the great technological achievements that have changed the world. 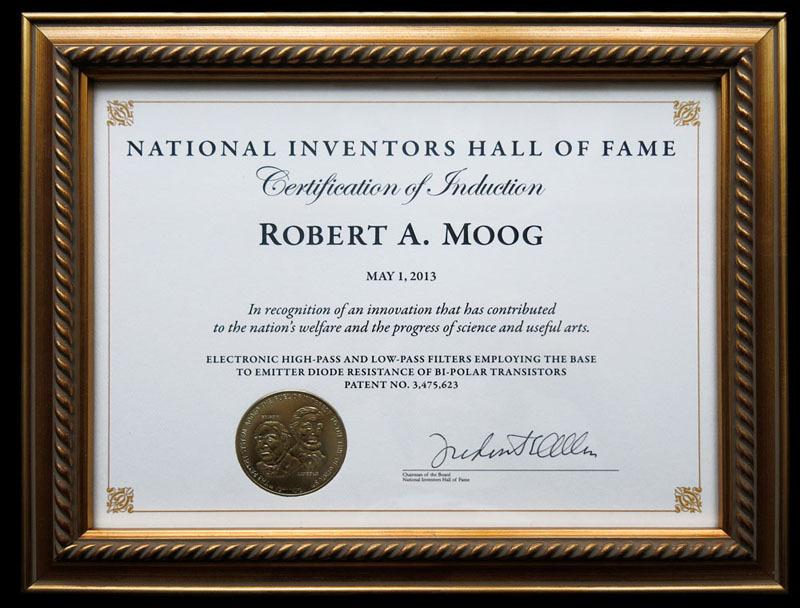 Bob was recognized for the invention of the Moog synthesizer through his patent of the Electronic High-Pass and Low-Pass Filters Employing the Base to Emitter Diode Resistance of Bi-Polar Transistors, also referred to as Patent 3,475,623, or among Moog fans, as the Moog Ladder Filter. I was honored to be the family representative receiving the induction certificate on my fathers behalf. The induction ceremony was held in the Madison Building on the campus of the United States Patent and Trademark Office in Alexandria, Virginia, right outside of Washington D.C. A black tie affair in this sweeping building made for an impressive backdrop to this exalted occasion. It was the people involved, however, that made the event truly stunning. The scope of the American inventive spirit was literally embodied as you looked around the room: Andrew Viterbi and Irwin Mark Jacobs (major contributors to CDMA technology that is used in cellular telephone networks), Arthur Ashkin, (inventor of optical trapping), Leonard Flaum, John Daugman (inventors of Iris Recognition), Sara and Laura Safir (representing their father, Aran, also an inventor of Iris Recognition), Garret Brown (inventor of the Stedicam), the family of the late Alfred Loomis (inventor of LORAN — Long Range Navigation), and many more. The impact of the 2013 class of inductees was truly astounding. 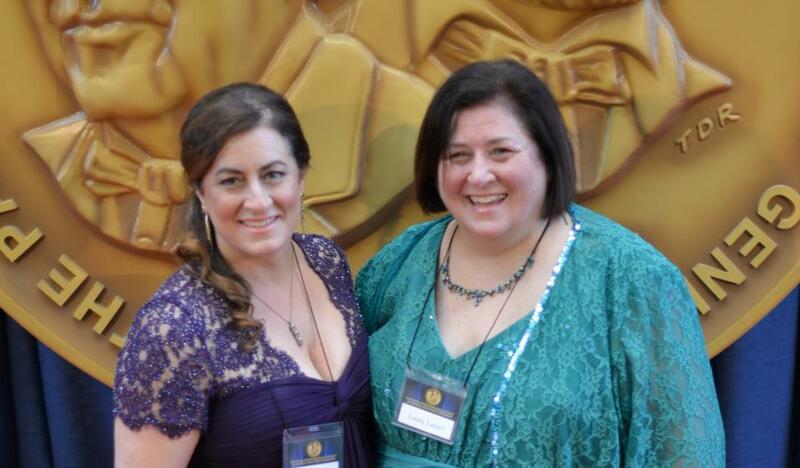 Michelle Moog-Koussa (left) and Laura Moog-Lanier (right) at the National Inventors Hall of Fame induction ceremony. Photo Credit: Ash Harrison. In attendance with me was my eldest sister, Laura, her friend Ash, and Pam Lewis, the Director of Entrepreneurship here in Asheville. We had the honor of sitting with the family of Alfred Loomis, who was a genius inventor, businessman, and philanthropist. His family regaled us with stories of their grandfather (he would be 125 years old this year) including them in his experiments. We talked a bit about the drive and passion that inventors share  theirs is not just a path, its a quest. Innovation does not happen in isolation, at least for Bob Moog it did not. My father’s innovative spirit and vast accomplishments were at least partially born of those who came before him. He was inspired by the ideas of luminaries such as Leon Theremin and many others who pioneered electronic musical instrument development in the early 20th century. Likewise, his achievements were inspired by hundreds of musicians with whom he worked over his long career. Musicians who, in his words “have literally composed our contemporary musical culture, who have created from scratch the world music that brings us all together”. 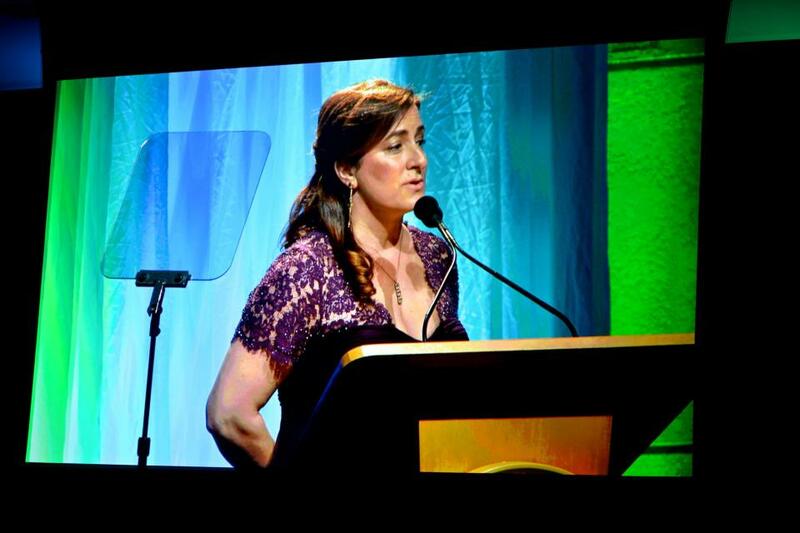 Michelle giving her remarks at the National Inventors Hall of Fame induction ceremony. Photo Credit: Ash Harrison. On my fathers behalf, I would like to thank the pioneers and musicians who inspired his work. If he were here today, I know that he would also express his appreciation for Ileana Grams-Moog, with whom he shared 11 very happy years prior to his passing, and to Mike Adams, his former business partner who is now the President of Moog Music, Inc. Thank you very much for this honor. I know that my father would have been proud and humbled to be among such a highly esteemed group of curious, dedicated innovators. 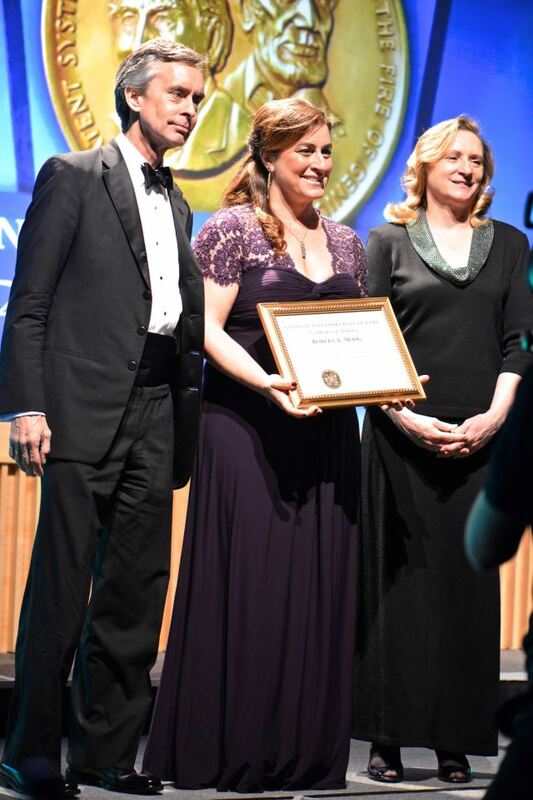 Michelle Moog-Koussa accepting the plaque on behalf of Bob Moog at the National Inventors Hall of Fame induction ceremony. Photo Credit: Ash Harrison. Sitting with Andrew Veterbi at the morning rehearsal, I asked him how he processed the fact that the technology he helped develop had an impact on a billion and a half people. He smiled, and like so many inventors, deferred the adulation to a wider observation that the impact had less to do with the technology and more to do with the shifts in social behavior that arose around the technology. 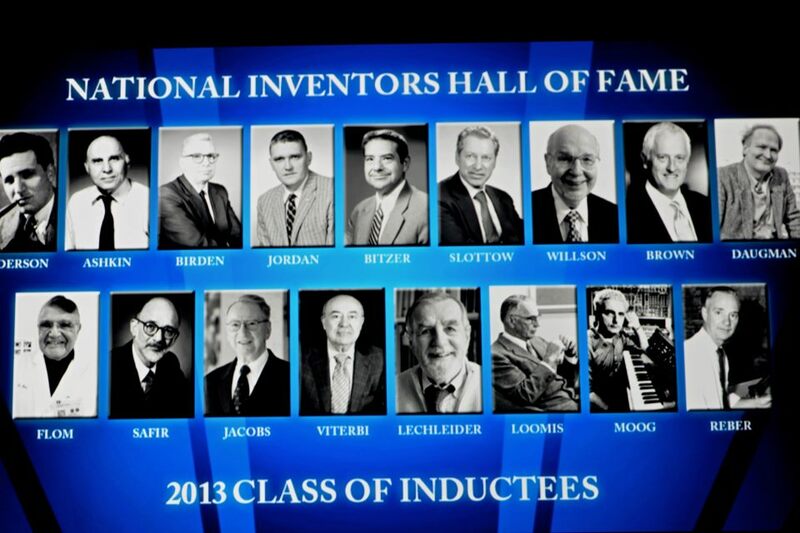 2013 National Inventors Hall of Fame inductees. .because Im not really great at small talk. he said. He wouldnt have had that concern at the National Inventors Hall of Fame Induction ceremony. The people being honored that night were birds of a feather, with the same passion for knowledge, innovation, collaboration, and integrity that he pursued his entire life. Among this crowd he would have found great resonance.